Er Ya Tea is a company specialising in the sale of quality tea, teaware and tea-related gifts. The company was established by Lorna Lu from Yunnan, China who is now based in Kyle of Lochalsh in the Highlands of Scotland. 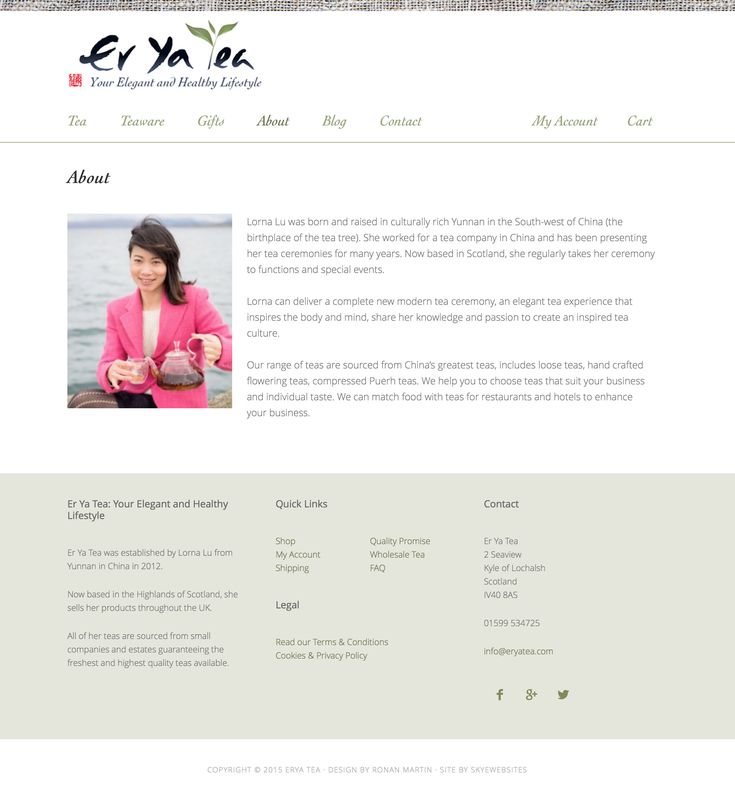 As online sales are an important aspect of the business, it was important to Lorna that she had a professional, quality website which would promote the company and enable Er Ya Tea to market and sell products throughout the UK. The business promotes an elegant and healthy lifestyle and therefore it was required that the website logo and design reflected these key ideals. Skyewebsites worked in partnership with graphic designer Ronan Martin to carefully construct the perfect, elegant design with an organised layout suitable for e-commerce and easy to use for mobile devices. The website has a simple, clean-edged look with an oriental inspired grid formation which is offset by natural, organic colours and curved fonts. As well as hosting an online shop facility the website also incorporates a blog and information page through which Lorna shares her knowledge and passion for specialist teas, reflecting the personal, individual aspect of the business.